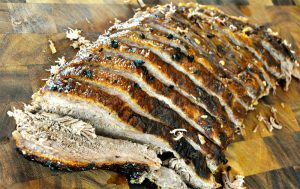 It’s important to enjoy whole food protein sources like this Easy Beef Brisket in your fitness meal plan. In addition to being one of the most delicious dishes you’ll ever make, you may be surprised to find it is one of the easiest. Don’t let the lengthy cook time deter you. It’s as simple as mixing up a marinade, letting it sit overnight, and then popping it in the oven to slow cook for half of the day. Make it on the weekend and enjoy the delightful aroma as it cooks. 1. Combine all of the ingredients, except the brisket, in a bowl. Mix well. 2. Place the brisket in a large roasting pan, fat side up. Cover with the marinade. Cover the roasting pan tightly with foil. Marinate in the fridge for 24–48 hours. Let those juices do their flavorful magic! 3. Roast at 300 ̊F for 4 hours, or 40 minutes per pound. Remove the foil after 4 hours, place under the high broil for a few minutes to lightly char the top. Transfer to a cutting board and slice. Put the slices back in the juices. Serve hot. Enjoy!